Should the Capitals Keep Karl Alzner? The Washington Capitals will have to reevaluate their blue-line situation this offseason, especially because many of their defensemen are pending free agents. They will also have to decide on the future of one of their longest-tenured defenders: Karl Alzner. 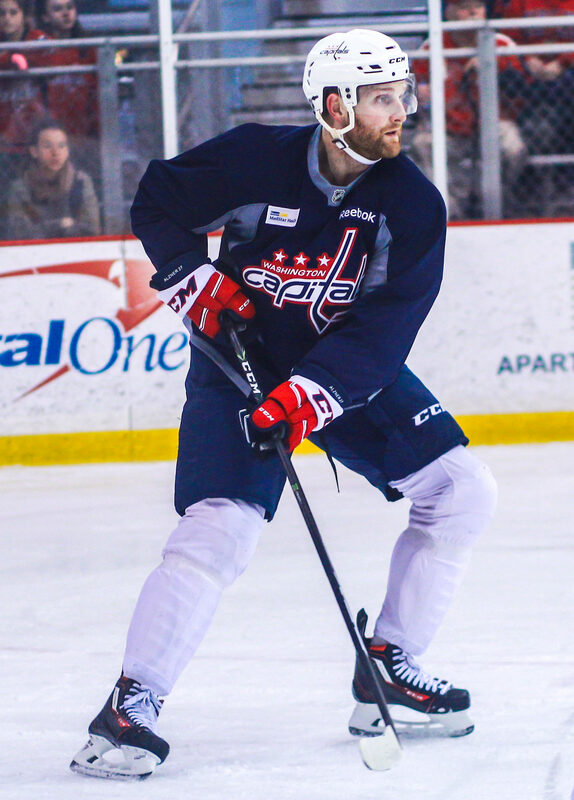 Playing in the Capitals’ organization since 2008, Alzner has developed from an up-and-coming AHLer to a full-time top-four defenseman. However, the 28-year-old faced a share of struggles this past season and didn’t look too much like himself. With that being said, and considering he is set to hit the free agency market July 1, is Alzner worth re-signing? While there were many upsides to Alzner’s season, he also faced some setbacks and inconsistencies in his play. First off, he had a personal milestone, playing in 599 consecutive games through his career. He also finished as a plus-23 with 105 hits and 162 blocks. Alzner’s season has been plagued with inconsistency (Photo by Sammi Silber/THW). Alzner had no problem continuing his shutdown game and was able to serve as a huge asset for the team. When playing with John Carlson, Alzner played outstanding hockey and showed great chemistry with his longtime defensive partner. The two combined to be one of the NHL’s top shutdown pairings, and during the 20-game span they were together, Washington went 16-2-2. However, the season was also filled with some struggles. First, Alzner’s possession metrics were awful; he had the worst analytics of any defenseman on the team’s roster. Not only did he give away the puck 52 times this season, but his relative Corsi sat at a career-worst -7.5. This means that with Alzner on the ice, the team spent more time playing defense and, in turn, had to spend more time in their own zone. Not to mention, the offensive-minded Capitals didn’t get to spend too much time getting shots on net with Alzner on the ice. And, while the 6-foot-3, 219-pound defenseman had no problem defending, this is not a good look for his team. Alzner turned the puck over multiple times and looked as if he had trouble looking after the play and taking care of the puck. Much like Edmonton Oilers defenseman Kris Russell, Alzner can play quality shutdown hockey and block a lot of shots, but he isn’t the best at hanging onto the puck or stopping the opposition before they get shots off. Additionally, through 82 games, Alzner finished with just three goals and 13 points. This is his lowest-scoring campaign since he scored 12 points in 2010-11. Though he is a shutdown defenseman, Alzner was able to move the puck much better in previous seasons and still found ways to contribute offensively. Analytics shouldn’t tell the whole story, though. Watching Alzner, he looks after the puck and can read plays extremely well. He’s a proven shutdown player and utility guy; however, this season, he faltered, and didn’t play with the same vigor he has shown consistently throughout his career. 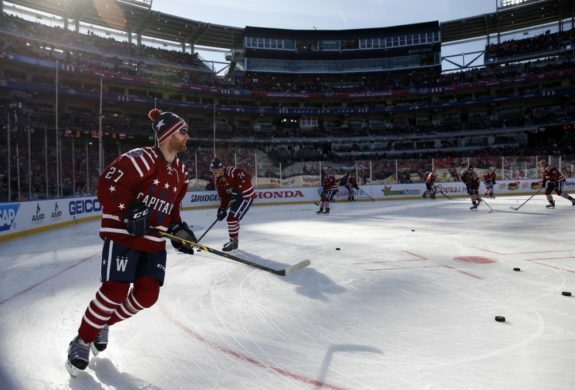 The root of Alzner’s struggles can be traced back to the offseason, where he had to get surgery on a sports hernia he suffered toward the end of the 2015-16 campaign. Though he was up and back skating again, and ready to go for opening night, Alzner wasn’t himself. Usually, Alzner is the Capitals’ irreplaceable top-pairing blueliner. He plays a defensive-minded game but takes good care of the puck. However, this season, despite remaining in the lineup and being the “Iron Man” prone to injury, Alzner’s play was plagued with inconsistency. In addition to recovering and fully readjusting to the game following hernia surgery, Alzner also faced struggles with upper-body injuries heading into the postseason, which kept him out for critical playoff games. While injuries also played into Alzner’s struggles, perhaps who he was paired with led to some other setbacks in his game. While he worked great with Carlson, he had to adjust to a new defensive partner after Carlson fell victim to injury. He spent some time playing with Nate Schmidt, and though the duo didn’t put up the worst stats, Alzner did post a better Corsi without Schmidt than he did with him. The same can be said for Schmidt, who appeared to do much better without Alzner. Overall, injuries and struggles readjusting to his former style of play seem to be the problem for Alzner. He is a quality blueliner who can block shots and play a shutdown game, but his poor possession numbers and turnovers, as well as his defensive-minded style of play, had a negative impact on the Capitals this past season. Will the Capitals Hold on to Him? Out of all of the team’s pending free agents, Alzner is the longest-tenured Capital on the roster. He has proven to be a stable presence on the back end for years, but as time has gone by, his numbers have been on the decline. Taking that into account, as well as recent adversity when it comes to injuries, Alzner is not the player that the Capitals have come to rely on night in and night out. Even so, he wouldn’t require the biggest pay raise, but if the Capitals plan on trying to keep players like T.J. Oshie and Justin Williams, they should put their attention towards those names. Those two players alone had a bigger impact on the team this past season than Alzner, and they should definitely get priority before Alzner does. The Capitals also have to worry about Andre Burakovsky, Dmitry Orlov and a handful of other players, pushing the team’s urgency to re-sign a banged-up Alzner further down the totem pole. On the contrary, this season was Alzner’s only poor showing over the course of his career. He has been a consistent part of the Capitals’ lineup for some time and has proven his ability to be a go-to guy for the team. Alzner has played in every critical game for Washington since 2008 and has been there through the changes. In all of these scenarios, Alzner never failed to impress and gave his full effort each game. Assistant coach Todd Reirden praised Alzner for his positive impact on the team. You don’t win 55 games in this league if you don’t have players who do that for you. We’ve won 111 games over the last two years, and [Alzner] never missed one of them. He’s played in all of those situations; he’s had a huge role in helping us have that type of success as a team. Overall, Alzner is a quality blueliner who has plenty of strong qualities, and analytics and statistics can’t measure how good of a player he is. Watching him play, he usually takes good care of the puck and outworks his opponents, and thrives when it comes to shutdown hockey. If the Capitals do decide to bring him back, it should be on a short-term deal. If he proves himself and rebounds in that time period, he will surely be a part of the team for years to come and possibly his whole career.